This week, our family participated in the 7-day Real Food Challenge. This challenge was supported by a network of bloggers ready to encourage people to leave behind the habits of finding convenience and comfort in pre-packaged factory-made food. I started out the week thinking it would be pretty easy. We’ve been embracing the idea of real food for sometime. And as food prices continue to rise, we seriously consider what is worth eating and therefore becoming. 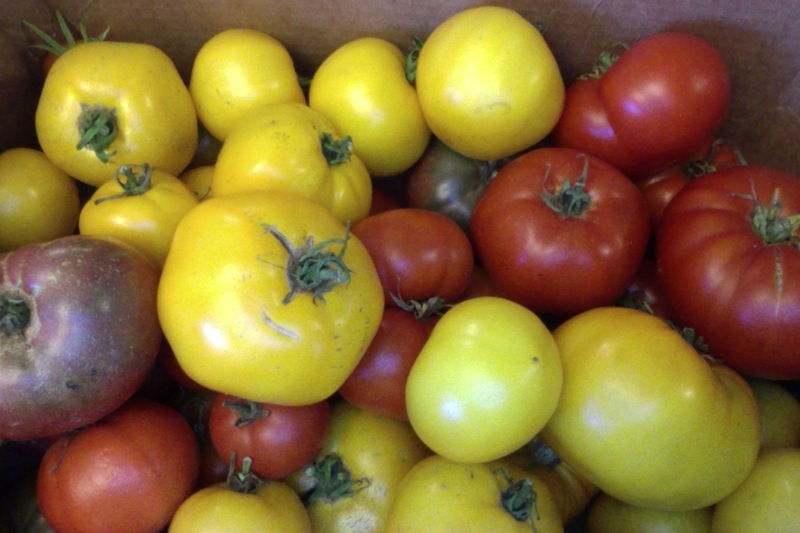 Our large summer garden yields produce that we preserve as pickles and jams that last well into the winter. We get our eggs from our chickens in the backyard. We often hunt for meat or purchase it from local farmers. 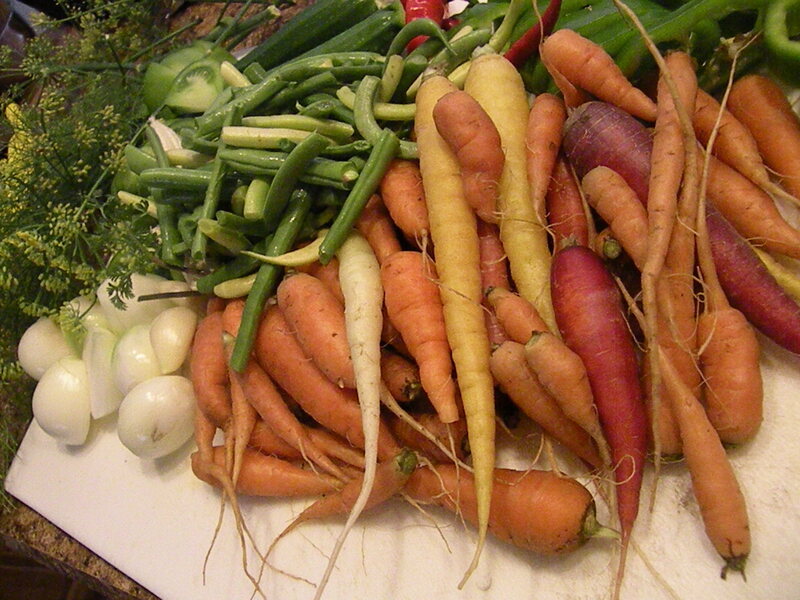 During the summer months, we celebrate the abundance of food and rarely eat anything that isn’t fresh, let alone real. Working on this challenge in January does make it trickier. As it is this time of year that we do end up relying on many industrially-produced foods. This challenge only made me more aware of it. Every time I reached for coffee, tea, juice, or hot chocolate I said, “Damn! Well, at least it’s not Pepsi!” The boys asked for cereal every morning, though they didn’t always get it. We had factory-processed tortilla chips with homemade salsa. I didn’t feel like we were in the position to give up milk, cheese, and other processed dairy items. Even the things we rely on most, the flour, sugar, and leavening agents come packaged. More than anything, we took the time to make our meals with mindfulness. We ended up with more dishes, but some great times. We took time to plan out our leftovers and found the opportunity to be spontaneous to find things that would go together. We fully appreciated the jalapeno jelly, the yellow-tomato basil jam, the pickles, and the sauerkraut fermenting in the kitchen. The challenge became about the experience of food in the home. In the past year, home has become a place for dreaming, experimenting, and testing ideas to see how they fit with reality. The real food challenge this week made me really appreciate what my home means to me, what food means to our family, and what we mean to each other. Here is a list of highlights from our week. Don’t get me wrong, I still threw pre-packaged granola bars into backpacks for mid-morning snacks. I still enjoyed that Swiss Miss hot chocolate. The greatest effort came in preparation for breakfasts and dinners. The highlights from those I share from you. But overall, we enjoyed the reality that our food brings us. 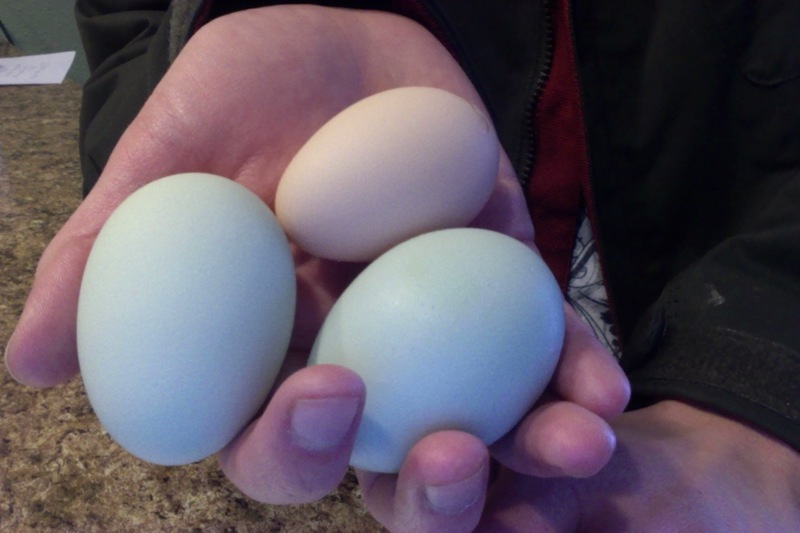 I went out in blizzard conditions to check on the chickens and found three lovely, warm eggs! On Sunday, we enjoyed homemade pizza with venison-pork sausage, pickled eggplant, and feta cheese after inspiration came from the blog site, Well Preserved. On Monday, I enjoyed an egg scramble with kale, pepitas, and garlic for breakfast and for dinner we turned to the homemade chicken noodle soup in the freezer. On Tuesday morning, I woke up early to make pancakes for my boys and for us adults we used the sausage leftover from Sunday with some kale and Swiss cheese to make a splendid quesadilla. For dinner that night we had Choucroute garnie. It sounds fancy, but really it is sausages cooked with sauerkraut and potatoes. Wednesday night, we used the giblets from the ducks we butchered earlier in the week (which is another story) to make a wonderful version of dirty rice. Thursday afternoon I thawed and heated some winter onion soup from the freezer and that night for dinner we had beef with rice (set aside from the dirty rice recipe), beansprouts (that my oldest child ‘grew’ during the week), and pickled summer squash from the cellar pantry. Friday night is our usual pizza night, but I had a cold, needed rest, and had a grant contract to work on. This is the night that I feel like we ‘cheated’ as I sent my husband to the store to buy take-and-bake Ciabatta bread. He topped it with olive oil, roasted tomatoes (preserved from the summer harvest), spinach, and mozzarella cheese and toasted it in the oven. Saturday morning he made us all a brunch of waffles with real whipped cream and maple syrup. For dinner, we enjoyed steak, potatoes, spaghetti squash, and spinach. Posted in Cultivating the Soul and tagged challenge, experience, food, winter. Bookmark the permalink.